Devoti Sailing is delighted to announce the launch of the Devoti D-Zero. The D-Zero was launched at the RYA Suzuki Dinghy Show 2014, at Alexandra Palace, London on the 1st and 2nd March 2014. The D-Zero is based on the Punk dinghy, the unique concept designed by Dan Holman. The Punk has already enjoyed considerable success on the UK dinghy racing circuit. Helmed by Dan himself, on PY 1050, the Punk has made a memorable impression at some of the UK’s best known handicap events. The only thing missing has been a prominent boat builder to build and market this great design. After extensive testing at the Dinghy Academy in Valencia, Spain*, the co-operation between Dan and Devoti has refined the original concept design and produced a boat that is poised to take the single handed dinghy market by storm. The Punk was a great boat, the D-Zero is spectacular! 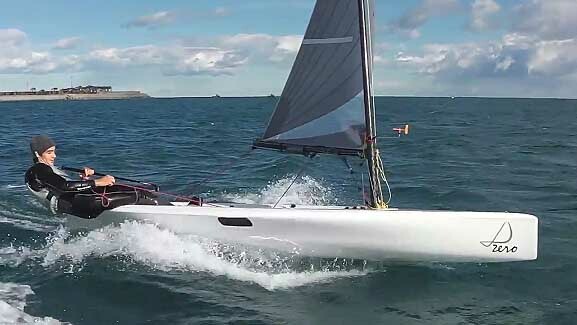 The D-Zero is a single handed performance dinghy, fully fitted by Harken, with a two piece carbon mast and a 8.1m2 sail, raised by a halyard, and a carbon boom. The hull is 4.2m long overall with a beam of 1.42m. It comes complete and ready to sail.